Dear primary care doctor, Jeff Bezos is about to devour your lunch. All of it. And then he’ll eat the table, the plates, the napkins and the utensils too, so you’ll never have lunch ever again. Oh yeah, and they’ll also finally disrupt and fix health care once and for all, because enough is enough already. Mr. Bezos, it seems, got together with two of his innovator buddies, Warren Buffet from Berkshire Hathaway and Jamie Dimon from J.P. Morgan, and they are fixing up to serve us some freshly yummy and healthy concoction. This is big. This is huge. It comes from outside the sclerotic “industry”. And it’s all about technology. The founders are no doubt well versed in the latest disruption theories and Ambergan will be a classic Christensen stealth destroyer of existing markets. When the greatest investor that ever-lived combines forces with the greatest banker in recent memory and the premier markets slayer of all times, who happens to be the richest man on earth, all to bring good things to life (sorry GE), nothing but goodness will certainly ensue. Everybody inside and outside the legacy health care industry is going to write volumes about this magnificent new venture in the coming days and months, so I will leave the big picture to my betters. But since our soon to be dead industry has been busy lately bloviating about the importance of good old fashioned, relationship based primary care, perhaps it would be useful to understand that Ambergan is likely to take the entire primary care thing off the table and stash it safely in the bottomless cash vaults of its founders. It’s not personal, dear doctor. It’s business. Ambergan will be your primary care platform and you may even like it. I am not sure what Mr. Buffet is contributing to this venture, other than cash and the warm bodies of his employees to pilot the venture. As to Mr. Dimon, he could probably run a modern analytics-based, risk-assuming health management entity, a.k.a. insurance company, while blindfolded and with both hands tied behind his back, so he may be useful in the short term. Let’s face it though, the most interesting actor here is Mr. Bezos and his Amazon platform of everything. 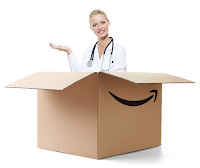 Whatever else happens, it is probably safe to assume that within the next ten to twenty years, most people will be getting much expanded primary care services directly, and almost exclusively, from Amazon. Amazon is a transactional platform, where people buy and sell things that Amazon does not make, and often does not even stock. With its more recent forays into TV, movies and music, Amazon also has some experience selling, mostly subscription based, services to consumers. As strange as it may sound though, most Amazon profits come from a very different source. Amazon Web Services (AWS), a computing platform (cloud) service, mostly for businesses and governments is a modest part of Amazon revenues, but a huge contributor to its profits. This lay of the Amazon land practically begs for a little cross pollination, and health care may very well be the ideal vehicle for that. Cloud services like AWS are essentially eliminating inhouse professionals and expertise in maintaining the basic infrastructure of computing, outsourcing it all to Amazon. Rings a bell? You can almost see the Amazon ads for its primary care services, telling hospitals that they should concentrate on their core business, which is cutting people open and stitching them back together, and leave routine care to Amazon’s primary care platform, expanding or shrinking just in time to match organization demands, with guaranteed uptimes of 99.99999%, and so forth. And you can almost see the direct to consumer ads too, can’t you? Sure you can. You know you can. A few days ago, before the Ambergan announcement sent the health care markets into a tailspin, Amazon hired a top doctor from one of those trendy primary care corporations that like to misrepresent themselves as Direct Primary Care (DPC). People speculated that Mr. Bezos, who previously invested in another failed DPC organization, may be ready to try his own hand at fake DPC for his own employees. Meh… It didn’t sound right to me, because with or without Ambergan, the Amazon stars were already aligning towards a massive thrust into health care, from the bottom up, as any good disruptor usually does. A few weeks ago, Amazon offered us an opportunity to invite Jeff Bezos into our bedroom. No, he won’t interfere with anything. You won’t even know he’s there. He’ll just sit quietly beside your bed and watch you sleep, until you ask for something, if you do, and if you don’t, that’s fine too. It’s called Echo Spot and other than being unusually cute, the camera/microphone device that looks a little like an old-fashioned alarm clock, is just another extension of the Alexa line of surveillance/service products that run your home and your life, which is precisely what an ideal primary care doctor is supposed to do, i.e. keep you healthy, where health is defined as “a state of complete physical, mental, and social well-being and not merely the absence of disease or infirmity”. You will subscribe to Ambergan Health. You will be monitored by Alexa in your home and maybe a future tiny Echo will let Alexa go outside with you. Perhaps they’ll throw Apple a crumb here to keep an eye on you when you leave your home, although it’s becoming increasingly unclear why you should. When you feel sick, you will summon a doctor on your Echo screen, and eventually he will appear preemptively before you get inconvenienced by any symptoms. You will be examined, diagnosed, treated and monitored in your home. And this should take care of most needs of most people most of the time. Not only is this a good start, but it’s a foundational step, and a perfect place to practice, because you can’t cater to complex needs if you have no idea how to care for simple needs. Will there be room for marginal plays in drug pricing and maybe devices or exclusive contracting with delivery systems, as most experts (who drove health care into the ground) seem to think? Maybe, but negotiating lower prices for bulk purchasing is neither unique nor disruptive. It does sound like Ambergan will begin by deploying its services to its own employees, but make no mistake, this cannot be about creating yet another middling scheme for self-insured employers. If that’s all Ambergan is, there will be no innovation and no disruption. This must be about the entire health care market. This must be about doing to health care what Amazon did to retail. Amazon didn’t kill retail by restricting consumer choice to idiotic narrow networks of starving suppliers. That’s the Walmart model. Amazon decimated retail in precisely the opposite way. This is a business venture gunning for large market shares, and yes, I know it’s not seeking profits right now, but the entire Amazon retail bonanza started without profit and it remains mostly so to this day. If you’re a primary care doctor, soon you will be able to have your own little storefront on Amazon, instead of or in addition to some strip mall or non-descript medical building. You will have to provide specifications for your services and cash will be king. Remember those new interstate licensing compacts? That will help here and so are the ever more relaxed telehealth rules and regulations. How about the recent rise in burned out doctors and cash practices? It’s almost like this was meant to be. For the initial enterprise offering, substitute doctor farm for server farm and you get the AWS of medicine. For the end result, add another layer to the AWS, and substitute each doctor in the farm for say, detergent or movie, and you get the grand idea. Since everybody is shopping for substitutable services, this is the perfect insertion of the high-volume retail model into the high-profit AWS model. Ambergan need not buy clinics, employ doctors or contract with systems, although it might start out that way. It just needs to get as many doctors as possible on the Amazon Health platform and have them compete, while people review and rate them into oblivion or success. The Amazon platform IS the network, and there will be terms, conditions, stars and promotions. There certainly are many legacy obstacles to overcome, and perhaps that is why Amazon couldn’t or wouldn’t go it alone. Throwing highly regulated markets wide open requires two strong lobbying arms, and a federal government willing to play fast and loose. The stars are indeed perfectly aligned for the first true disruption of our health care since 1965.